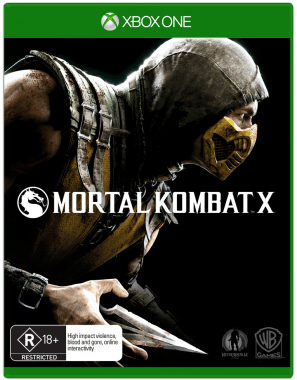 Mortal Kombat X is the tenth title in the main fighting game series (just in case you don’t know your Roman Numerals), but the ‘X’ also represents the next generation, not only in consoles, but in fighters on the roster. 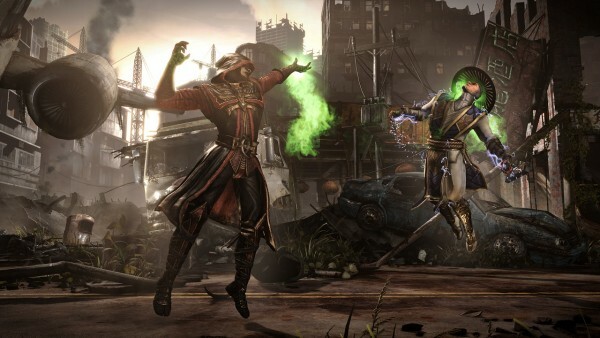 Mortal Kombat X introduces many new wrinkles to the series, including the meta-game Faction War, ever-changing Living Towers, Kustom Kombat, offspring and relatives of beloved stalwarts (who may be on their way out due to age), and three fight style variations per character! 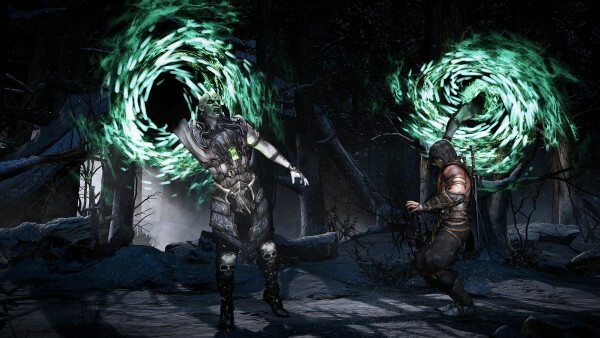 NetherRealm Studios has always done the best job in giving fans options for longevity, and they hope Mortal Kombat X will keep you occupied for weeks, if not months at a time. WARNING: minor spoilers ahead. Mortal Kombat X‘s story takes two plotlines and binds them with a single thread: Shinnok and his amulet. 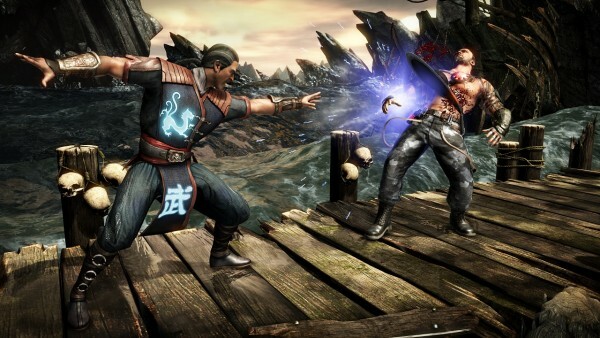 At the conclusion of Mortal Kombat (2011), and even beforehand for that matter, it was assumed that its sequel would cover the events of Mortal Kombat 4, Deadly Alliance and beyond, at least partially and with a new twist as the newly established timeline informs. While that may not be the case entirely, characters from the two aforementioned games make appearances, both in playable and non-playable capacities. Shinnok in particular gets his due, holding the presence that a fallen Elder God should. The story opened shortly after the end of Mortal Kombat (2011), with Quan Chi leading Netherrealm’s forces, comprised of Oni and undead revenants such as Kabal, Stryker and more, against Earthrealm in an attempt to take control of its life force, the Jinsei. Soon enough, Shinnok shows himself, getting his hands dirty in the invasion by using his amulet to stave off Raiden and God of wind Fujin (who, sadly, is only present in the opening chapter). 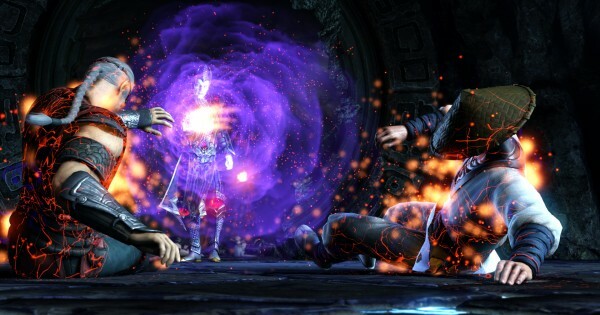 Johnny Cage, having become Earthrealm’s champion (after all, there weren’t many options left once Sindel wreaked havoc) alongside Sonya Blade and Kenshi aid the gods in imprisoning Shinnok once again, this time in his prized amulet. We then skip ahead two decades, periodically flashing back 5, 20 and even 25 years (that’s just after Liu Kang defeats Shang Tsung, when Shao Kahn invades Earthrealm) in the past for exposition’s sake. Outworld is in political turmoil with Mileena leading an uprising against its new Emperor, the usurper Kotal Kahn. Meanwhile, a new Special Forces unit of talented youngins have been tasked with finding and retrieving Shinnok’s amulet, which had been stolen and replaced with an elaborate fake, something Raiden discovers quite quickly. 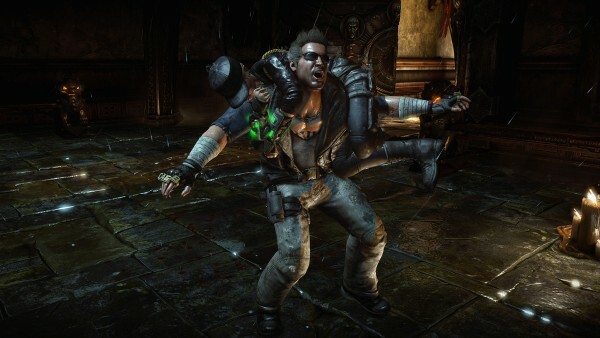 Turns out the amulet plays a vital role in the Outworld power struggle, with our new heroes Cassie Cage (daughter of Johnny Cage and Sonya Blade), Jacqueline Briggs (daughter of Jax), Takeda (son of Kenshi) and Kung Jin (cousin of Kung Lao) caught smack-dab in the middle. The Story Mode plays out over a dozen chapters and is considerably shorter than its predecessor’s, which is the biggest drawback. Playing on Normal, it will likely take you just over 4 hours to complete. Also disappointing is the fact that new characters, including Erron Black, Ferra/Torr, D’Vorah and Kotal Kahn, are barely fleshed out, in fact, their backgrounds are breezed over. It feels largely like a simple introduction, or a setup for future tales, which can be said about many aspects of the Story Mode. I guess we’ll have to rely on the official comic books for more information. Outside of Story Mode, there is a lot to do. 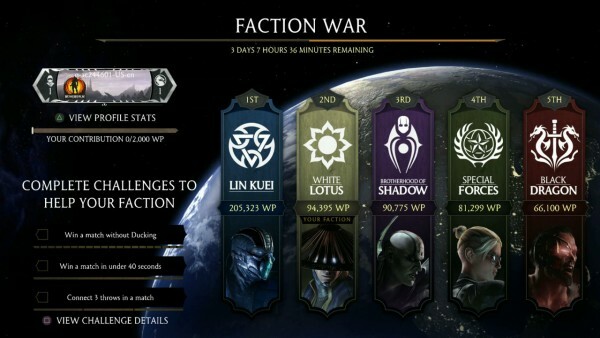 At the outset, you are asked to choose a faction for the Faction War meta-game, which will pose objectives to you on a daily basis. Each week, a faction will be named victorious, and it’s your duty to aid your chosen faction by simply playing the game, earning faction XP. Getting into the actual gameplay, if you’re the kind of player who wants to main a character, perfect them, and then head online to crush everyone, Practice Mode will accommodate you in doing so. It is deep and fully-featured with frame data, easy variation switching, match Recording/Playback capabilities and every setting you’d want to have. You can even enter the Training Room stage and select different stages’ interactables, so you can work on stage-specific strategies (too dedicated for my tastes). As mentioned, every character has 3 variations. What this means for gameplay and match-ups is that strategy plays a larger role in selection, if only because a character can no-longer be singled out for being slow, or purely a rushdown fighter. Take Raiden as an example. In ‘Thunder God’, he can extend his lightning based combos, ideal for high damage in close. His ‘Displacer’ variation adds the ability to phase, so Raiden can control positioning, surprise the enemy and avoid projectiles. And finally, his ‘Storm Lord’ variations allows the manual setting of traps, something new to Mortal Kombat. Diversity and dynamism are the name of the game here. Offline there are Traditional Towers to tackle, ranging from the Klassic tower (which grants you narrated motion comic-esque endings), Test Your Luck and Test Your Might towers, the Endless tower (exactly what it sounds like) and the Survival tower (which tasks you with fighting on with carried over health). Completing each of them nets unique awards, such as character skins. Test Your Luck and Test Your Might can also be played against a friend, as well as the regular Versus mode of course. Added this time is Kustom Kombat, which allows the players to manually select which modifiers they would like to fight with. It’s a fun party game mode that smartly caters to the entry-level fight gamer and expert alike…skills is practically neutralised when things get crazy. 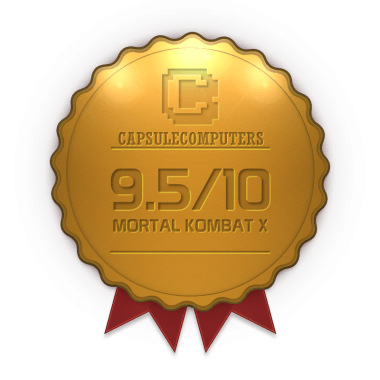 One of the most ridiculous modifiers has to be Dizzy Fatality Kombat, where either player can be finished off randomly during the fight, with only a 2-3 window each time. Speaking of which, the fatalities in Mortal Kombat X are gruesome to say the least. Spilled guts, jaws used as ashtrays…it gets worse from there, trust me. Brutalities also make a comeback, although in a new, more sudden and humiliating (for the victim) form. All characters have 5-6 of them, each requiring the player meet certain stipulations during the fight in order to pull them off. Lastly on the finishers list, there are Faction Kills, 5 for each faction, all of which are comparatively easy-as-pie to execute. Ranking up in your faction will unlock these. Additionally, Living Towers have effectively replaced Mortal Kombat (2011)‘s Challenge Tower. There are three in total: one which changes hourly, one daily, and the other – called the Premiere Tower – is almost a promotional tower, letting the player try out DLC fighters before they are available and such. Again, in the same vein as earlier, completing these earns rewards. The Hourly tower usually unlocks a solo modifier for Kustom Kombat mode. It might sound small, but completionists will be driven mad by it. Something serious gamers will be happy to hear is that the netcode appears to be notably better than in the past. Online is smoother (from what I’ve played), with Versus and King of the Hill returning, along with Team Battle, which pits teams of 5 players against each other (1v1 at a time of course, there’s no tag kombat in this iteration) for the glory of your Factions. And if all of that isn’t enough to occupy you, NetherRealm have basically made the Krypt a separate lite-adventure game all of its own! There are items to pick up and add to your inventory, zones to unlock, collectables to buy (duh) and pop-up wolves, corpses and spiders…I hate spiders. And yes, I jumped…more than once. It’s so large, you’re supplied with a multi-page map! How anyone can not appreciate these efforts is beyond me. I could spend hours in the Krypt alone, which is a testament to the team at NetherRealm Studios. I can’t help but feel this is the first Mortal Kombat entry where the team at NetherRealm felt “we’ve finally realised our vision”. The graphics, lighting, character design, environments…they all add up to build a suitably dark tone that Mortal Kombat X should be known for. Well, along with a little tongue-in-cheek. The lighting system shines here (no pun intended), lending to said atmosphere, probably the best example of which can be observe on the ‘Sky Temple’ stage. Of note in character design, the female face models are less manly and more feminine (a real criticism of past games), and their costumes no-longer risque for the sake of it (don’t even mention bandage-wrap Mileena), but indeed practical and representative of their personalities and backgrounds. Musically, Dan Forden does his signature Mortal Kombat magic. There might not be an instant classic tune like the “Rooftop” or “Subway” tracks from Mortal Kombat 3, but they hit the right note nonetheless. Lots of celery was snapped, goo squished and watermelons punched in the making of Mortal Kombat X‘s sound effects, but the result is the most cringe-worthy moments. Even without any visual aid, they’ll have you squirming in your seat. For all those whining because their favourite character didn’t make the cut – I feel your pain. At the same time, let’s be realistic: we don’t truly want another Armageddon on our hands, and with time constraints, memory allocation and other factors, it’s just not feasible anyway…unless you wanted to wait another year for the game? But I’m sure then you would complain about the “agonising wait”. And for those complaining about the “Easy Fatality” micro-transactions, just don’t use it. Simple. Unless you are absolutely useless and need them, does it actually affect your experience? No. My only real gripe with the game is the Story Mode and its brevity. But, then again, only a handful of years ago a Story Mode in a fighting game was unheard of. Otherwise, Mortal Kombat X is superb, offering a wealth of offline and online-centric content to keep you playing for weeks, if not months. And the three variations per character adds variety and strategic depth, helping to make Mortal Kombat X the most fluid, fun, technical fighter in the series. Now, excuse me while I kill this BLOODY POP-UP SCARE CORPSE! *Ahem*….